Much better visual improvement then v.1. Please check it out and let me know what you think. Please post your comments/complaints/suggestions/etc. Download to your computer -> Open Theme manager in Firefox (Under Tools Menu) -> Drag and drop .jar file into theme manager -> Restart Firefox. Nice! I like it very much Now if there were one in the pipeline that had a blue background.... Thanks! Clean Skin Sid Now if you can just do something about that throbber..LoL..
Yea, I know. Version 2 will have that changed. I just need to figure out what to do for it. I ended up blanking out on the throbber idea. But I am working on it. Thanks for the comments Akoloutheo and Double Zero. Like it better. blends in pretty nice with analyze. Since you mentioned complaints, I have 2 (minor) - home is slightly blurry & reload is cut off on the bottom. Home is suppose to be bumpy looking, but now you say it, reload is slightly cut off. I'm going to fix up some of the icons, fix up the options menu, add a throbber (as soon as I think of a good one), and add a couple little things. I've been busy lately to work on version 2 but hope to have it completed soon. Maybe switch reload to throbber and come up with different reload? I'm thinking the reload would be a cool throbber with a bright little (neon green?) electron whirling around. Just like the atoms in the old filmstrip we used to see in science class. I did think of that, I just don't know what program to use to come up with something like that. I'm a newbie at making animated gifs. If I was given a direction with a suggestion of a program to use. I might be able to do it. if you have psp it has animationshop. If you can't find giffy, let me know if you want me to send it, it's only about 223kb zipped. Forgot... There is also easytoon. If you start with that, you can then extract all frames with different programs - I use irfanview alot for that. Then recolor the frames, change to transparent with giffy, then put it back together with gifanimator (i can't remember if easytoon will do that part). If you want to play with stick figure gifs look for PIVOT. Same style for ur web site skin. If it was not for you I would not know how to install it. I have only tried some from the firefox site and I have not used any of those. This is the first one I am using. I found a couple problems with this that will hopefully be updated soon. Alot changed between versions. I at least wanted to get it to work so you can temp view it. I noticed alot of people were still downloading it and it didn't work at all. Please be paitent. Really nice skin! Does it work with FF 2? I guess I'll find out when I try to install it. I think it had alot of issues with FF2, I need to find the development notes and get everything coded for it. I've found that the scrollbars are broke on a couple versions of FF and the Options section doesn't show. I'm working on these bugs. I didn't find out about the scrollbars till I ended up going to a site that needed them and realized that they weren't there. They should of worked, but I'm trying to figure out why they're not. Same with the Options area, by looking at the code it should be coming up, not isn't. It looks like I may have to start from scratch and redo it from the ground up for version 2.0 that I want to bring out. If anybody pulls apart my skin and finds the problem. Please let me know, I'll be greatfull. Since I've been out of the skinning loop for a long time and now getting back into it, I was a little slow figuring out how to get this working. I'm going to do two versions of this skin. First, I'm releasing version 2.0 for Firefox 1.X. Than going to make one for FF2. However, I will test the skin on both and if it works, I'll let you know. [01-03-2009] For those that are downloading this, this skin will not work with Firefox 2 or Firefox 3. 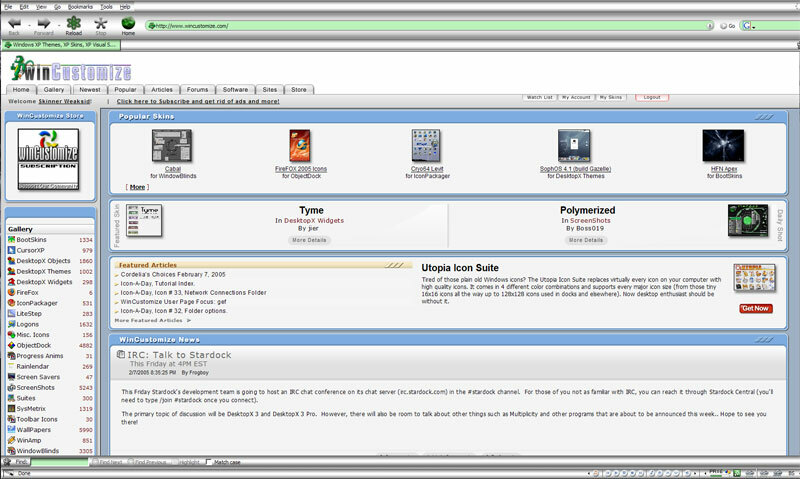 After I'm done with a couple of my non-graphic projects, I am planning on rebuilding this skin for Firefox 3. I'll have to see what changes they've made since Firefox 1. Life decided to take me in a different direction so I was never able to get this updated. Life is getting more situated so I should be able to get back to it after I get a few more things done. Thank You and sorry for the wait. i have a suggestion. can you update the format for Firefox 3.0.1? That would be nice. Don't chance the theme or colors. just update the format. I would rock that theme all day.